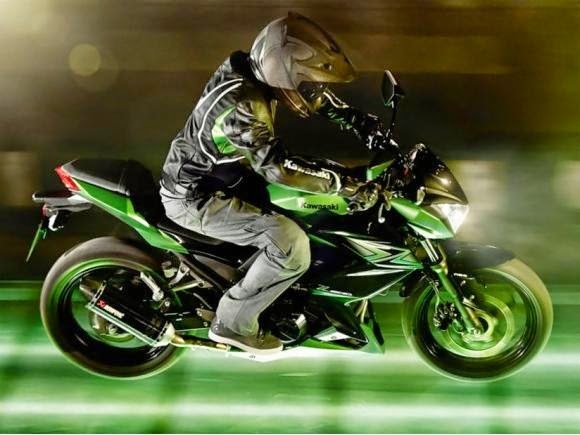 Kawasaki Z 300 is a small beast on two wheels. 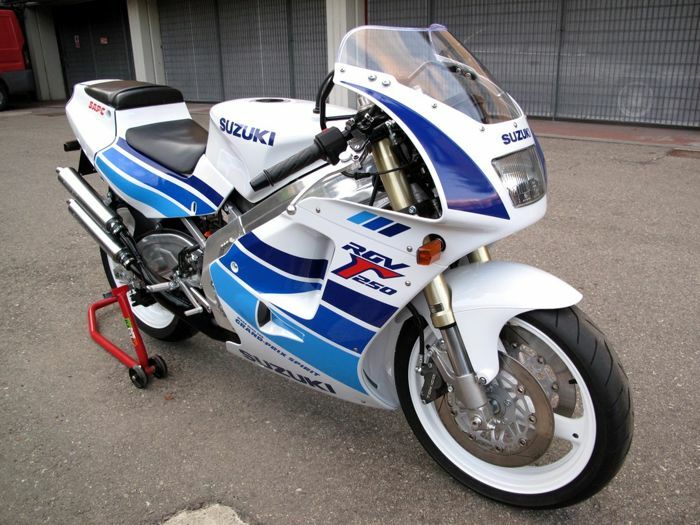 Small displacement motorcycles do not mean poor performance and outdated design. On the contrary, the new machines "in" are increasingly stylish and flashy. This is the case of the new Kawasaki Z 300, presented to the public late last year during the Hall of Milan 2014. 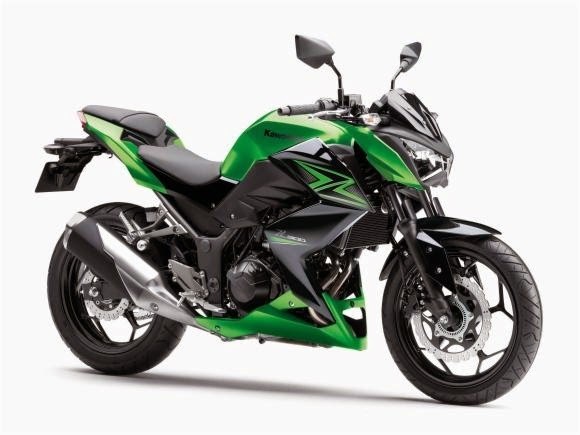 The design follows the same aggressive and modern lines of the Z 800, which includes the minimalist tail, a compact front optics and stylish, and a fairing "muscular" for a motorcycle 300 cc. The naked also won a panel of sports instruments, which combines digital information with analog. 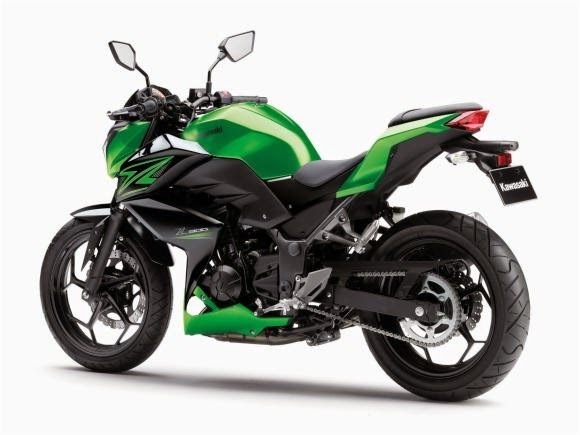 To offer a sporty performance, but at the same time urban - main feature of naked bikes - the Z 300 is equipped with the same chassis and engine Ninja 300, but has wider handlebars. The amendment, combined with the engine of 296 cc two parallel cylinders, promises to leave rivals behind, but without giving up the upright and relaxed riding position. Confirmed only for Europe - but with great possibility to come to Brazil - the Z 300 is available in green and black colors. 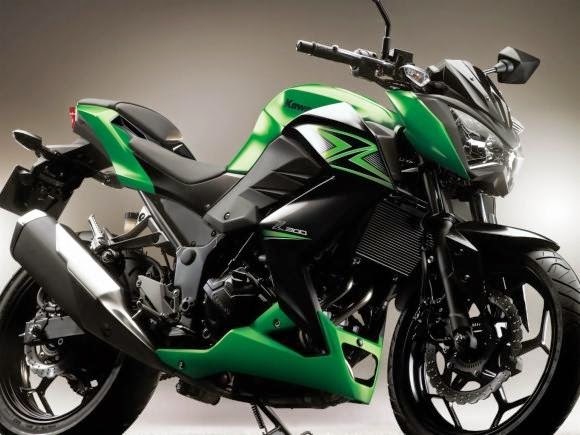 Kawasaki Z 300 is an evolution of naked Z 250 found in the Asian market. And just as with the "Ninjinha" in its transition to 300 cc, it received some important changes in the propellant, which have changed their behavior. The course of the pistons, made of aluminum, increased from 41.5 mm to 49 mm and as a result brought new connecting rods, duct resized admission, plus new crankshaft and balancer shaft. By having the same architecture, the motor 300 of the Z has the same characteristics as the sports mini sports. Reaches the maximum power of 39 horses 11,000 rpm and torque of 2.8 kgf.m to 10,000 spins, which shows its tendency to work in higher regimes, with the pointer of the tachometer almost red. Furthermore, the motor also has the benefit of a liquid cooling system to maintain the propellant resized always optimally operating temperature. Just as the family of the mark superesportivas, Z 300 also includes a system of double throttle precisely controlling the air intake, resulting in a more linear throttle response throughout the power range. The slip clutch of small superbike is also present in naked. As the heart of the bike, the entire chassis of the Z 300 is based on her cousin superesportiva. Its steel frame type diamond gives strength and sportiness needed to transform it into a pure naked. To minimize the vibration characteristic of the two-cylinder inline engines, Kawasaki adopted rubber cushions on the attachment point between impeller and frame. AZ 300 has fuel tank of 17 liters and weighs 168 kg in running order for the standard version and 170 kg for with ABS. The suspension set consists of telescopic fork with 37 mm stroke and 120 mm at the front tubes and rear monoshock Uni-Trak type with 130 mm of travel. 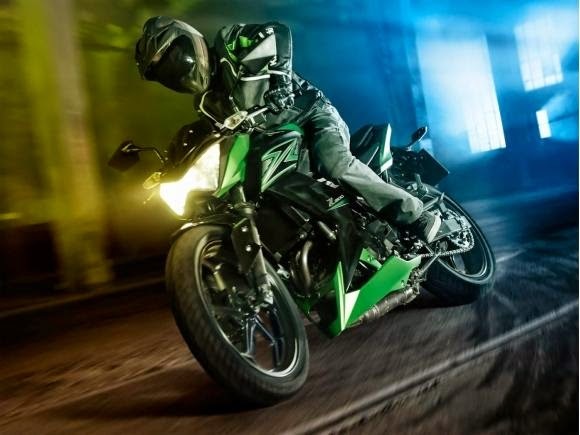 According to Kawasaki, the standard configuration of the assembly ensures a comfortable working for urban and firm steering for a sportier driving. The rear spring provides five levels of preload adjustment made with the aid of a key. Available in two versions, one without and one with the ABS system, the Z drive 300 has bitten by 290 mm caliper two pistons at the front and 220 mm disc clamp also two pistons at the rear. The disc petal format, which aids in heat dissipation comes from the Ninja family models. Another item from the sports, this time the ZX-14, aluminum wheels are ten tips that the Z 300 are shod with tires rim 17 '' in the measures 110/70 front and 140/70 at the rear. Kawasaki has not officially confirmed the arrival of the Z 300 to some countries. However, the Ninja 300 presence in the domestic market and the absence of a representative of the brand in the category of small displacement nakeds, we can assume that the Akashi home market the model here. After all, in addition to further enhance its product line in the country, will intensify the competition in the segment, making the joy of the rider.